Can’t wait to see how things will turn out in the end. Is this place alomg one of the main roads in the city? Ive only been to Penang once but it seems like I have seen it before. Hi Amee — I think that will be a long wait! But thank you for coming along for the ride. This really struck a chord with us living in Taiwan. Hsinchu has some incredible old houses scattered throughout the city– some collected in neighborhoods, others on their own between newer building. Though most are derelict and covered with vines, you can still see how beautiful they are– the big wooden window panes, the tiled roofs, small decorative details. Yet they’re basically on a path to all be torn down. They’ve bulldozed large neighborhoods of these buildings to make new apartment buildings, which, unfortunately, are rarely a fraction as attractive (I am putting that politely). Bordeaux and I once passed by a house like this and were shocked to see that it had been cleaned up– it had gotten freshly painted, and the yard around it was landscaped. We were really impressed, because the loss of these buildings has been a long complaint of ours. A few days later we went by again– it was torn down. It was being used as an office from which to market a new ‘luxury’ apartment building that will now go up in its place. I can understand the need to use space by building up, and I get (but don’t agree with) wanting to be seen as modern by promoting the new, but it seems like a terrible waste to bulldoze history and unique local character to make way for buildings that are by and large characterless and generic. Xander – all too common too many places I’m afraid. We went into a cafe called Ant’s or something like that, in Hsinchu, occupying an old house. Sort of quirkily done — the ‘open kitchen’ literally is — but I could imagine living in a house like that. It’s great that George Town has the Unesco designation in that it’s saved a LOT of buildings that would have otherwise been torn down. The downside is that developers seem to have been given a free-for-all on the rest of the island. There are so, so many wonderful mid-century bungalows and other buildings out in Penang ‘burbs that are slowly being torn down to make way for really ugly apartment towers/gated housing developments, etc. If I had 2 million dollars…. Robyn, lovely post. My husband and I share your love of the old – 20’s era Spanish colonial in California, traditional stone house near Ephesus, Turkey. Now in Istanbul, our apartment is newish but in the most ancient part of town. I’m saddened each time another row of narrow wood houses is destroyed to make way for garishly ornate tourist hotels. The same old/new disconnect exists here as well. For us, new places have no soul, and don’t provide the proper backdrop for our vintage textiles and furniture. Give me that cracked (but real) plaster any day. Enjoy your renovations, and thank you for saving an old building. Hi Amee — yes, we’re right in the heart of George Town, within the Unesco conservation area. And I too can’t wait to see how things turn out in the end! Thanks for following along. Catherine — thank you. We can’t take credit for saving the building; thanks to the Unesco world heritage designation that George Town received 3 yrs ago no structures within the conservation zone can be demolished. And happily that has been pretty well enforced (regulations about preserving building facades are another matter entirely). But there are so many boutique hotels popping up in former homes and businesses that I feel good about moving into the city and doing what we can to keep it from being hollowed out and becoming a little-populated “boutique city” along the lines of other world heritage cities in the region like Luang Prabang, Laos and Hoi An, Vietnam. Oh, I am SO GLAD there are people like you in the world! It totally breaks my heart every time I see or hear of old buildings being torn down and with it, some history and the soul of the place. I’d almost rather it become some boutique hotel or tourism centre, if that means it gets preserved, but it’s so much better knowing that here, at least, there will be a real family living in it! 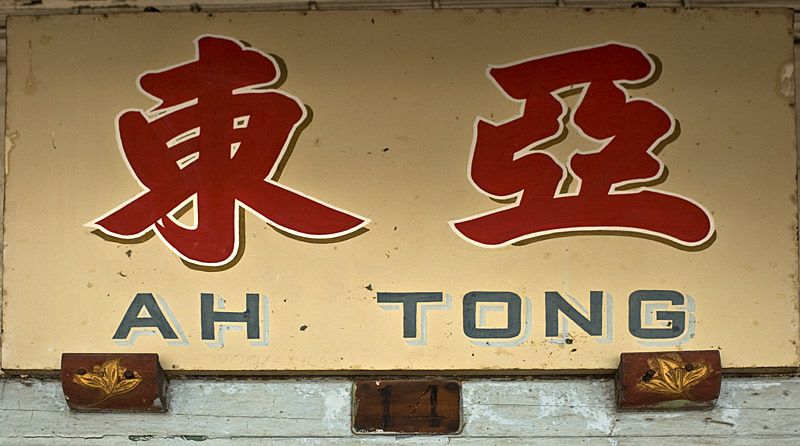 Good luck with the restoration, and thank you for preserving a small slice of Malaysia. I only just ‘see’ this post about your Ah Tong’s house. Normally I read the food blog. I was from Malaysia, Taiping to be exact. I have the same problems with the mentality of my own people. I loved old buildings, old furnitures, pots and pans — I see history, and most of all I see tastes and qualities (even if the building is plan, most materials are much better quality than present day). With my old jobs moving around, and me moving between countries, I bought quite a few house. UNINTENTIONALLY … all OLD houses. Well let’s say 40, 50 years old. Most Chinese, especially those from Mainland, could not comprehen. A few even tried to discourage me and went as far as telling me … you do not know the background of the people who lived here in the past. Might bring bad luck!! And YES … the last sentence — bad luck. I think is what most Chinese are afraid of. At least those that I have/had associated with. I am Malaysian Chinese by the way. THerefore I think I understand better than most westerners. Thanks for your comment — seems we’re cut from the same cloth. And yes you are so right about the superior QUALITY of materials/craftsmanship in old houses. Our contractor, who has been doing what he does for more than 40 years, recently finished building doors for us. All tongue and groove, not a single nail used. You just don’t see that kind of workmanship much anymore. And I understand about the Chinese concerns re: luck and fortune. You don’t know who’s lived in the house, you don’t know what’s happened there, you don’t know if someone has …. died in the house. It’s a different type of concern than what most Westerners bring to house hunting for sure. We just finished painting a room upstairs. We stopped the painter after the first coat on the walls — it could have taken another coat, but with just one coat we could see the texture of the plaster, the unevenness of the wall. We could see that the house has a history, and that’s how we decided to leave it. It’s unlikely that *most* Asians would elect to do the same with a “new” house. 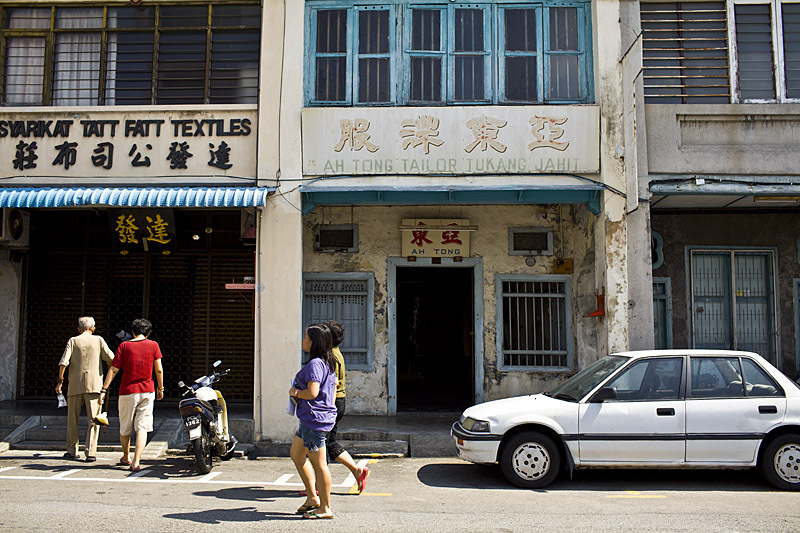 By the way, here’s a link to a guest house/event space in George Town, owned by a Chinese Malaysian who values the oldness of these buildings as much as you and I do. You might enjoy having a look. Really looking forward to the photos of Ah Tong! Hello there, You have done an excellent job. I’ll certainly digg it and for my part recommend to my friends. daily by reading such pleasan articles oor reviews. Hi Just wondered if you could share the contact of your contractor with me. I have just bought a house and need some work done to upgrade it.